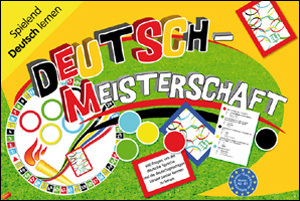 Deutsch-Meisterschaft is a fun challenge game to test your knowledge of German language and of German-speaking countries. Players will improve their cultural awareness by answering questions on various topics including civilisation, traditions, geography, linguistic expressions, places and free time. All of the questions are written in German, so this is a game that will test and build German vocabulary as well! Deutsch-Meisterschaft is aimed at children learning German as a second language and is suitable for intermediates who are able to confidently read and respond to questions in German. This would be best suited to children aged 11+ (Key Stage 3) but would also be a good game for advanced Key Stage 2 children. Your German knowledge has to be very good to play this game, so I did not find it very useful as my students are just starting to learn German. Even I found the questions quite tricky.